Hot Aisle & Cold Aisle Containment: Which one is best for us and our situation? The short answer is: Each location varies! Certain factors will dictate whether you isolate the hot aisle for the cold aisle. 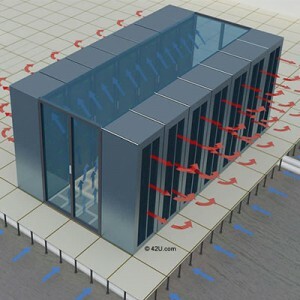 A Hot Aisle Containment System (HACS) encloses the hot aisle, allowing the rest of the data center to become a large cold-air supply into the servers and floor power equipment. 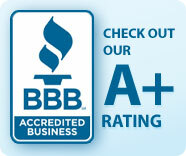 It’s best that we sit back and talk with you to best understand what you have in place and review your needs. Between the two, for new build type of situations, we’re seeing a hot aisle containment is the most chosen for raised floor Data Centers. Hot aisle containment in short consists of a physical barrier that guides hot exhaust airflow back to the AC return and uses natural process of ‘warm air rising’ to help efficiency. The higher the heat back to the AC coils, the greater the efficiency by adjusting temperature (RH set points and lower AC fan speeds). Another advantage of hot aisle containment is the thermal override. This is when the surrounding cold aisle areas (typically larger in square footage), act as insulation, keeping the entire data center more stable until power or cooling is restored. 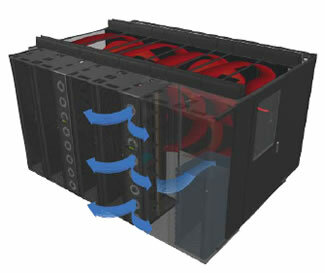 A Cold Aisle Containment System (CACS) encloses the cold air in the aisle, allowing the rest of the data center to become a large hot-air return plenum. One type of containment consists of a physical barrier that allows the supply air to pool inside the cold aisle. This “lid” ensures a uniform and predictable air temperature at the server in-take. Note: if the data center is cold aisle contained, consideration for room cooling of any 3-phase UPSs and floor PDUs is needed. We see a lot of cold aisle (lid) contained project for in-row cooling project on slab floor. For Legacy data centers, again, it really does depend on your existing infrastructure and we see both HAC and CAC containment. There can be some difficulties with the installation with existing overhead racks, and sometimes the servers aren’t positioned in the best hot aisle and cold aisle containment configuration. So there are a lot of different little variables with an existing legacy data center that weren’t intended to become data centers but now are but none the less will benefit with some containment. The energy savings, we are seeing, can be up to 30% higher if we completely contain either the cold or hot aisle to eliminate airflow mixing. This will also ensure your racked equipment will run longer, if it stays cooler. Remember to also blank those empty rack U’s with blanking panels and include any gaps in between cabinets. These are notorious for hot air wrap around and inefficiency. Blanking panels are a great low cost way to see immediate improvements.